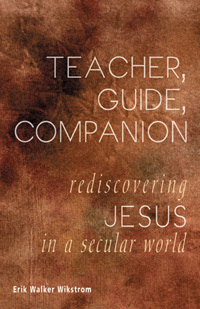 Drawing from the personal experiences of a seasoned pastor, the scholarship of the liberal Jesus Seminar and the gospel accounts of the life of Jesus, Teacher, Guide, Companion challenges readers to reexamine their own relationship with Jesus Christ and its significance in the 21st century. Integrating both secular and religious source materials, Wikstrom demonstrates how a close examination of historical findings and the Gospels can lead to a renewed faith in Jesus Christ. The field of Jesus study, which is widely dominated by academics, will benefit from this analysis by a working minister. Wikstrom, born a Presbyterian and raised a Methodist, is pastor of the First Universalist Church in Yarmouth, ME. Click here To read an opinion article by Rev Wikstrom from the Boston Globe. He lived over two thousand years ago in a small town in a backwater province. He spent his entire life in an area slightly smaller than the state of Vermont. He never appeared on television. He never wrote a book. Yet this Jewish peasant—born to unwed teenage parents—continues to fascinate people, believers and nonbelievers alike. Who was he? What are we to make of the claims made on his behalf? And what, if anything, does it mean in the twenty-first century to profess to have a relationship with him? I first encountered Jesus when I was a child. I’m not sure what my Sunday School teachers intended for me to learn, but I can remember the image I formed of Him (in those days, always a capital “H”). He was white (like me) and had brown hair, which was long, straight, and impeccably groomed, as was the beard that covered his thin (nearly gaunt) face. His teeth were white and perfect; his eyes were a piercing blue and a little sad. His body was thin and wiry; his hands were soft and his fingers long. He wore a white robe that covered him down to his sandled feet. The Jesus of my childhood spoke softly, moved gracefully, and was always calm and gentle. He never raised his voice and never had negative feelings like anger, fear, jealousy, or self-doubt. He never even had a negative thought. Pure in word and deed, he was “perfect, as [his] Heavenly Father was perfect” (Matthew 5:48). He always knew the right thing to do and did it without hesitation. He was kind and good, compassionate to all, yet detached, unearthly. Jesus was something more than human. Jesus was held up to me as a role model, yet I knew his was a role no one else could ever hope to play. I knew that I, at least, would never be good enough.